When TECOM decided to renovate their Management offices in Dubai Knowledge Park, Swiss Bureau Interior Design were commissioned to design a contemporary office that was reflective of the future vision of the TECOM group. Innov8 Interiors took on the task of the entire design and build of the Serviced Offices – One Business Centre, Dubai. Natural red brick combined with warm timber, concrete flooring and exposed ceilings compliment the design intent. 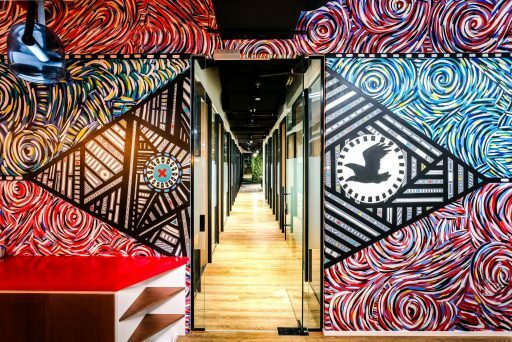 The ARK Africa Office in Nairobi was executed by Stonehenge who created a space that is industrial and offers the vibe of an open office that is funky and fun. Swiss Bureau has recently completed the design for SFM, a Dubai headquartered financial services firm specializing in offshore company formation. LinkedIn gave Perkins+Will exactly the kind of challenge designers dream of, and they soon realized that they would have to pull a rabbit from a hat to catch and hold their attention. Heidrick & Struggles appointed Gensler and Summertown Interiors for their interiors project at Liberty House in Dubai’s DIFC area. Bluehaus Group were appointed by Boston Consulting Group for the design delivery of its Riyadh office and Saudi Arabia head office. The brief was to create an office that feels professional and well thought out, but also young and vibrant to reflect the culture of the company. Candidates visiting the office are making big, potentially life-changing decisions, so the environment had to feel warm and welcoming.